Commander of the Baldwin-Ziegler Polar Expedition. 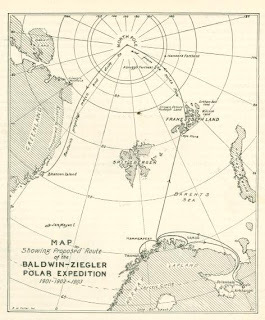 EDITOR'S NOTE.-This article constitutes Mr. Baldwin's only announcement to the public of the plans and purposes of the Baldwin-Ziegler Polar Expedition, which sailed from Tromsoe, Norway, July 17th. Evelyn Briggs Baldwin, the commander of the expedition, was born at Springfield, Missouri, July 22, 1862. After studying and traveling in Europe many years, he entered the service of the United States Government as observer in the signal service. 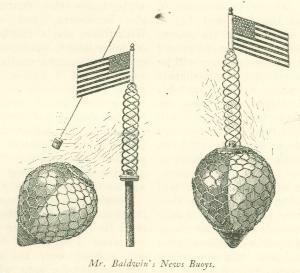 Mr. Baldwin accompanied the Peary Expedition of 1893-1894 as meteorologist. In 1897 he journeyed to Spitzbergen, hoping to join Andree's expedition, but there was no room for him in the balloon-car. Later he accompanied the Wellman expedition of 1899. To solve the mystery that lies hidden at the North Pole has been for many years the cherished ambition of my life. That I am now accorded an op­portunity to realize this ambition is due to the patriotic munificence of Mr. William Ziegler, of New York, who has placed at my disposal unlimited means to carry out my plans. Certainly no expedition ever sailed for the North with so comprehensive an equipment as ours, or perhaps with prospects half so bright. From the very first Mr. Ziegler has evinced a sympathetic interest in the fruition of the single purpose which I have so long kept steadfastly before me. On the day when he made my heart glad by announcing that he would finance the expedition, he said: "I do not want to see any but an American win the honor of the discovery of the North Pole, when so many of our brave country­men have sacrificed their lives in the effort to attain it. I think America is great enough and progressive enough to have that distinction." To Mr. Ziegler, therefore, will belong much - I may, without doing my comrades injustice, say at least half the credit, or glory, as it is commonly expressed, if this expedition succeeds in planting the Stars and Stripes first at the Pole. Our fleet comprises three vessels. The "America," our flagship, as someone has expressed it, is a three masted ship rigged steamer of 466 tons net burden, driving a single screw. Her length over all is 157 feet; beam, 27 feet; depth, 19 feet. She is constructed of solid oak throughout, having a sheathing of greenheart from keel to waterline. She is two feet thick on her sides, these increasing to two and a half at the bow. Only two years ago she was given a new keel and hull, and shortly before this new boilers and engines added to her orig­inal power or capability of pushing her way through difficult fields of polar ice. More­over, in addition to the foregoing, and for the present voyage, she has been provided with new masts, decks, and special accom­modations for the crew. Besides all this, she now boasts enrollment as a steam yacht in the New York Yacht Club, the burgee of which I have the honor to fly from her mast head. Before being rechristened, she was held to be the crack whaler of the entire Dundee fleet. And after all the repairs and overhauling at Dundee had been done, I felt certain that I had beneath my feet as. stanch and true a craft as I could wish for. The" Frithjof," a Norwegian sailing vessel, that has seen much service in the Arctic seas, was chartered to serve as a tender or supply steamer to the "America." 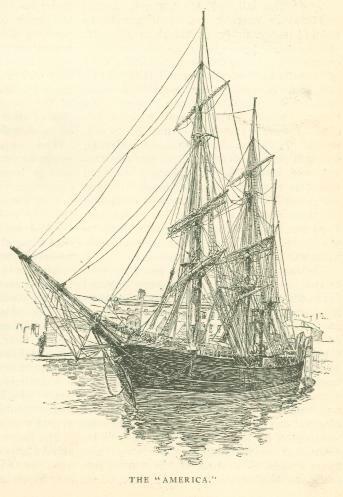 She is of the same general construction as the "America," although smaller, registering 260 tons net. Her cargo capacity is about 300 tons. In 1898 she bore me to Franz ­Josef Land, in 1899 she carried the Swedish Expedition under Professor Koltoff from Spitzbergen to Greenland, and now, in 1901, I expect to take her farther north than she has ever been before. I consider her peculiarly well adapted to the work mapped out for her, being in command of Captain Kjeldsen, who, for more than a quarter of a century, has taken many a vessel from Norway to Spitzbergen and Franz Josef Land in the ice, which challenges man's utmost skill in making a passage. It was Kjeldsen, too, who, twenty-eight years ago, was in command of the tender "Isbjorn," which acted as a supply vessel for the "Tegetthoff," the steamer under command of Payer, which bore the Austro-Hungarian Expedition northward on its eventful voyage of discovery - the discovery of Franz-Josef Land itself. The third vessel is the "Belgica," which carried the Belgian Antarctic Expedition of 1897-1899 under Captain Gerlache. Her experience in quest of scientific treasures from the southern regions of ice, as described in Dr. Frederick A. Cook's "Through the First Antarctic Night," likewise bears testimony that she is well fitted for arduous work in the North. She, too, is similar in construction to the "America," and is 110 feet long, 26 feet wide, and draws 15 feet of water. Under the able direction of Cap­tain. John Bryde and the sturdy crew of Nor­wegians, I do not doubt for a moment that she will accomplish the mission which I have established for her. The "America," after taking on all that part of her supplies purchased in the Ameri­can and European markets, sailed from Dun­dee, Scotland, for Tromsoe, Norway, at mid­night on June 28th, and was there joined by" the" Frithjof." By the time this article is published both vessels will be well on their way fulfilling their respective missions. The "Frithjof," while she will carry a large portion of our equipment, will be used to augment our supplies from the resources of the Northern Seas. She will have on board a party of skilled hunters, trained by long experience in the chase of seals, wal­ruses, bears, etc., and from my knowledge of the regions which she is to traverse, 1 am convinced that a large cargo of game will thus be procured. This meat will be de­posited at various points on the islands in the southern portion of Franz Josef Land, where stations will be established for the subsistence of our large pack of dogs. Numerous places are well known to me where game can he secured, even after the freez­ing over of the seal late in the autumn, and I purpose utilizing this knowledge in order to keep our pack of dogs at all times in the best possible condition. In other words, we intend, as it were, to colonize Franz Josef Land temporarily, at least. From Tromsoe the "America" will pro­ceed to Solombala, in the district of Arch­angel, on the White Sea, arriving there late in July. Here she will take on the 400 dogs, fifteen Siberian ponies, and a large quantity of other equipments, which were purchased more than a year ago. At the present time these are being brought over­land from beyond the Ural Mountains in Siberia by Tronthein, who furnished the dogs for Dr. Nansen, for the Duke of the Abrozzi, and for other expeditions. 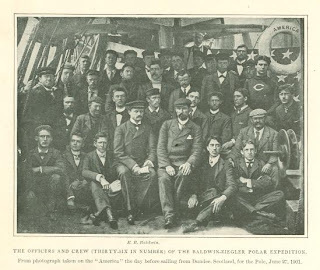 Here, also, six well chosen young Siberians, well trained in the handling of dogs, will bring our expe­dition membership to forty-two in number, this being exclusive of the crews of the "Belgica" and the" Frithjof." 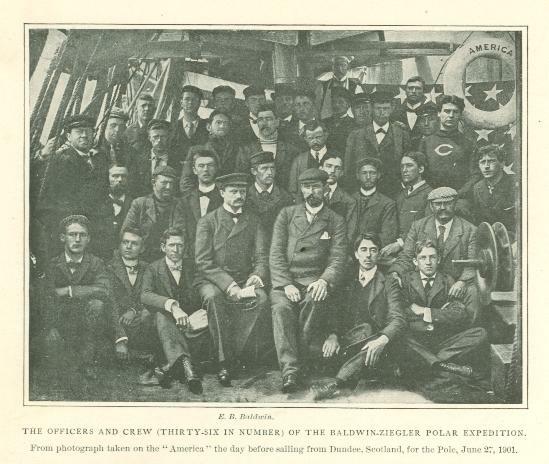 From Solombala the "America" will proceed to Hammerfest, Norway, to take on the very last shipments of supplies which are being forwarded to that port by the "Auguste Victoria." These supplies will include a dupli­cate shipment of machinery for our gasoline launch, the original having in some unex­plained manner gone astray. This done, the "America" will direct her course toward Franz- Josef Land. Here she will work in conjunction with the "Frithjof," it being my desire to proceed with both steamers as far northward through the British Channel as possible, their ultimate destination being Prince Rudolf Land, upon which the Italian Expedition spent the winter of "1899-1900.' So much I can, however, scarcely hope for, and I shall be well content if I can establish the main station of the expedition at some point on the eastern side of the Brit­ish Channel, on about the eighty-first degree north lati­tude. The manoeuvring of the two ships will continue as long as the conditions of the ice may permit, until about Au­gust 20th, when the "Frith­jof " will discharge her cargo on the most convenient ground and then return direct to Tromsoe. With the freezing up of the water spaces between the islands of Franz Josef Land, it will be comparatively easy to move our en­tire pack of dogs with sledges loaded with game to a still more northern point - to some spot where we shall hope that the "Amer­ica" may remain frozen in and our head­quarters established. Then will begin the work of transporting all of our necessary supplies and equipment to the very northern­most point in Franz Josef Land, where we shall build houses and establish an additional base for the winter. In order to facilitate the movement of' this large expeditionary equipment, use will be made of the fifteen Siberian ponies, each of which is capable of drawing from 900 to 1,200 pounds. The Siberian pony is well suited for the work re­quired of it in this expedition, being inured to cold and exposure, and accustomed to eat not only grain food, but dried fish heads as well. Owing to the generally level charac­ter of the ice between the islands this trans­portation should be readily accomplished. The value of these animals may be estimated from the fact that each is capable of draw­ing as much dead weight as a team of twenty dogs could do, and some of them will, there­fore, be used in the first part of our dash to the Pole, being slaughtered from time to time for dog food; or we may decide to slaughter them all after they have aided us in the transportation of supplies to our northernmost house in the world - that is, on the northernmost point of Franz Josef Land. Here their flesh will be kept over winter in hermetically sealed tanks made for this pur­pose. On an average we shall probably de­rive 800 pounds of good dog food from each pony, all of which, it will thus be seen, will not only have transported a large weight of equipment and food upon the sledges, but also itself upon its own legs. We also have with us a twenty-two-foot gasoline launch, which will be of great service in the water­ways between the islands, where the current is too strong to permit the surface to freeze early in the fall. Three portable houses will also be carried, and these are to be erected successively at intervals of, say, twenty miles, thus giving us movable head­quarters or stations from time to time. Each of these houses weighs about 1,000 pounds, and, being in sections, can be readily erected or taken down in thirty minutes or even less time. As each house is built with an air­space between the walls - that is to say, double - in case it should be found desirable, one wall only need be used at anyone sta­tion, and instead of three houses we shall therefore have six. As each house will then weigh but 500 pounds, our work of establish­ing these stations will be further facilitated. At our base station, more particularly on the "America," the following scientific work will be energetically carried on. Continuous meteorological records, such as the direct readings of the barometers and thermometers, checked by the self-register­ing barographs and thermographs; the force and direction of the winds, including the use of the anemometer in order to determine their velocities; humidity of the air and amount of precipitation. By means of the theodolite and the nephoscope we shall en­deavor to determine the velocity, direction, and height of the upper clouds. Special observations and' records concerning the phenomena of the Aurora Borealis will be made. In determining the height of the upper clouds as well as of the Aurora Bo­realis, we shall make use of the telephone, having a line not less than a few miles in length, at either end of which will be sta­tioned an observer, thus giving us our base line from which to form our calculations. Our magnetic work will comprise absolute readings each Monday, relating to inclina­tion, declination, and horizontal and ,vertical intensity; every Tuesday, readings of declina­tions and horizontal intensity will be made at five minute intervals for twenty-four hours. On our sledge trips we shall determine the declination at every stopping-place. At our base station our astronomer will determine accurately our latitude and longitude, the latitude by means of a fine zenith telescope, and the longitude by the observations of cer­tain stars. Time determinations for pendu­lum swings will be made by means of a meridian transit having a focal length of twenty inches and an aperture of two and one-half inches. Observations on low stars at low temperatures will be frequently made for determining refraction by means of the eleven inch vertical circle. We shall also make hourly observations on the tides for the space of two months or more, supple­menting these by as many simultaneous ob­servations at outlying points as conditions may permit. As extensive and accurate a map of Franz Josef Land as possible will be made by means of triangulation and the use of the topographical camera. Determina­tion of gravity will also be noted by means of pendulums. The expedition is exceptionally well equipped for photographic work, no expense having been spared to make our camera equipment complete. In addition to a num­ber of cameras specially manufactured for this trip, and fitted for both films and plates, the "America" has on board a moving-pic­ture apparatus, and with this we shall hope to secure many realistic scenes of our ex­citing life in the North; besides this we are to use a recently invented apparatus known as the omniscope, by means of which we shall be able to obtain panoramic views of extensive scenes, such as the chase of the walrus, bear, and seal, and panoramic views of coastline glaciers, far effects, our large transport teams, encampments, etc. Paintings and sketches, too, not only of Arctic life, but also of its indescribable color and magnificence, will be made by special artists who accompany us. The failure of former Arctic expeditions is attributable either to lack of proper equip­ment, or to inability to transport it over the long stretches of treacherous sea ice. The history of nearly all the expeditions which, since Hudson's time, have set forth to deter­mine the secrets so jealously guarded by the Ice Sphinx of the North conclusively proves this. The present expedition, however, typi­fies the spirit of the twentieth century, in that it will be enabled to take up the quest where our predecessors were compelled to abandon it. Our food supplies are of the best quality, and our stores are complete. We carry over 100 tons of dog food alone, includ­ing pemmican, dried fish, and dog biscuit. Even the dog food is well suited for human consumption. We have with us, too, a large stock of what might be termed luxuries ac­cording to Arctic requirements, many of which would tempt the taste of the most fastidious epicure. The list of our eatables would be far too long to be repeated here. Let a few samples suffice. Of course there is beef in all its condensed forms - extracts, tablets, etc.- pork and beans, in the form and size of an ordinary biscuit, which may be eaten as one would partake of a cracker, or boiled as a nourishing and wholesome soup. We have a sufficient supply of coffee in tablet form known as kado. This preparation rep­resents the very quintessence of the berry. A single tablet will make a cup of good coffee, but I value it chiefly because a tablet may be eaten without being prepared in the usual manner, affording as much cheer and warmth to the stomach in this as in any other form. Kado will be of great service as part of our noonday lunches on the sledge trips, when there is little or no time to pre­pare cooked meals. We also carry 1,500 tins of crystallized eggs. This product was manufactured at St. Louis, Missouri, under my own supervision, and from a stock of last spring's eggs - 72,000 of them. Fruits and vegetables, too, of all varieties, both evaporated and tinned, form an important part of our stores. Of condensed milk, chocolate, and lime juke tablets we are also supplied in the most generous manner. In brief, our larder lacks nothing that foresight, experience, and the generosity of Mr. Zieg­ler could suggest or procure. Perhaps the greatest element that prom­ises success in my plan to teach the Pole is the fact that. I purpose to compel a large portion of our food for both dogs and men to transport itself. I believe that the large pack of dogs which I have been most for­tunate, indeed, in securing, will help me very materially to solve the knotty problem which has baffled the illustrious men who have gone before me. It will be recalled that when Captain Cagni, of the Italian Expedition, set out on his perilous journey, he had with him about 100 dogs; upon his return but seven remained. The dogs were necessarily over-­laden to transport their own and their mas­ter's food. The load for sledges as adopted by other explorers has been from seventy-five to one hundred pounds dead weight for each dog. Dogs thus laden, being forced constantly to put forth their utmost efforts to draw their loads, fell into a poor condition, their energy being overtaxed from the start of each day's journey to the finish. The in­sufficient food with which they were forced to content themselves contributed to their lack of drawing power, and even when a dog died by the wayside, he was so emaciated that his body supplied but scant nour­ishment for his fellows. I have contended for several years that this overweighting was injudicious, nay, fatal, and I shall at no time assign a greater weight than fifty or sixty pounds to each animal. Under my plan I shall have at my disposal 400 sleek, fat, well fed dogs, weighing on the average not less than seventy-five pounds gross. Each dog, if slaughtered, will yield from thirty to forty pounds net of good dog food. It is an axiom in Arctic work that a dog can render good service if provided with one pound of food each day. Assuming that my pack cannot be provided with any extra food, which is far from being the case, how­ever, as I shall show further on, the pack itself could render efficient service and largely subsist upon itself for an approxi­mate period of 100 days; that is to say, there would be from thirty to forty survi­vors at the end of such a period. Peary and Astrup covered 1,300 miles in Greenland with heavily burdened sledges in seventy­-seven days; that is, they traveled at the rate of seventeen miles per diem. True, they journeyed upon a smooth surface, else, weighted as they were, their sledges would have broken down. N or could they have made this great record upon the sea ice; but with very lightly burdened sledges and a large pack of dogs, it would be a com­paratively easy matter to travel even more rapidly than they did over the very roughest sort of ice. I have known an Eskimo to drive a team of five dogs with the weight of the Eskimo on the sledge (say 150 pounds) as far as 100 miles in a day. With our complete outfit it will not be necessary for us to leave our base at the northernmost extremity of Franz Josef Land before the 22d of March, 1902, a month after the return of the sun, because I calculate that we can accomplish in less than 100 days from the time of leaving our head­quarters the object for which we are striv­ing, the distance in a straight line from our proposed base to the Pole being but 550 statute miles. Of course, I do not intend to compel the dogs to live entirely upon their own flesh. Their food will be varied with a generous supply of condensed dog food, and thus the pack will be kept at all times while on the march in fine trim. All the loose dogs in the pack will be provided with ad­justable pack pouches, each pouch to con­tain from fifteen to twenty pounds of con­densed food, fit for either man or dog. By this simple expedient I expect to move with great rapidity over the ice field toward the Pole, and nothing short of contingencies which no human power could avoid, will pre­vent us from planting the flag of our country at the northern apex of the earth. Having once established a strong outpost at the northernmost extremity of Franz­ Josef Land, at about eighty-two degrees north, the early part of the spring of 1902 will be utilized to throw out advance stations on the sea ice in a northeasterly direction before the ice shall have acquired much movement, so that it is not at all improbable that we shall begin the real march forward from a point between latitude eighty-two degrees and eighty-three degrees not later than the 1st of April. With our large pack of dogs, with our canvas and our silk tents and shelters and the most perfect comple­ment of improved sledges, collapsible boats, skis (Scandinavian snowshoes), etc., our northward trip cannot fail to be both rapid and safe. Is it not, therefore, reasonable to suppose - nay, even to believe, with full degree of faith that we shall be enabled to conquer at last the elements of the icy North, against which man has striven so long and yet so faithfully? In making our initial march over the ice lying to the northeastward of Franz Josef Land, we shall thus doubtless be aided some­what by the drift of the ice in a westerly direction. By making due allow­ance we shall be carried but little, if any, out of our course northward. Granting our at­tainment of the coveted goal, it is certainly incum­bent to make pro­vision for our escape, or rather, for our return jour­ney. The great Polar current, which is known. to sweep southward along the rugged east coast of Greenland, would appear to be our surest and safest way back. The "Belgica," therefore, leaves Sandefjord, Norway, early in August for the purpose of establishing an auxiliary station on that coast, preferably upon Koldewey Island, or, in failure of that, upon Shannon Island, and even in failure of attaining Shannon Island, at some point far­ther south. The "Belgica," too, carries three portable houses and a large quantity of food and equipment, such as sledges, boats, coal, petroleum, and clothing, and eatables sufficient for twelve men for an en­tire year. She will erect signals along the coast, by means of which the locations of caches and provision depots may be deter­mined by returning members of our party. Two of these signals will consist of steel tubes, each thirty feet high, each bearing at the top a weather vane displaying some of the expedition's insignia. Those having in charge the establishment of this station have been fully instructed as to the very great importance of it, for upon it the lives of men are likely to depend. Even should all of our party be carried westerly by the swiftly moving ice lying to the north­ward of Franz Josef Land, they would still have ahead of them a place of refuge. The moral effect, too, of the establishment of such a station will also be great. Once our party is at a high latitude north of Fran ­Josef Land, the word will be "Onward, ever onward." To the Pole at all hazards, and from the Pole by the safest and surest route. Evidently to the nearest land any party in such a position would most natur­ally make its way, and therefore to the northeast coast of Greenland we would look for our first place of rest and recuperation, there where the musk cattle are known to abound; thence southward along the unexplored coast we would make our way, aided not only by the southerly drift of the ice, but also by the game of both land and sea , and whether asleep or awake, whether journeying rapidly or detained storm­bound, hope would ever be before us, ren­dered stronger by the knowledge that every moment would be bearing us toward a well ­established station. No previous expedition to the North has ever made such complete arrangements for the transmission of news back to civilization as that which 1 have the honor to command. Six hundred buoys have been provided and are to be set adrift, 400 of them to be used in connection with our work in and from Franz- Josef Land, and the balance to be de­posited on the east coast of Greenland, for use of any of our party who may chance to arrive there. Each buoy is to contain news of our condition and progress. To send back these buoys we are provided with forty balloons packed for transport in hermetically sealed tin cases. Each balloon, with the exception of two larger ones, has a capacity of 3,000 cubic feet, and measures when inflated thirty-one feet in height and sixty-three feet in circumference. They will be inflated with hydrogen gas made by the vitriolic process. It is intended that some of these balloons will be released at intervals during the Arc­tic night, and each will be freighted with a number of the news buoys, containing mes­sages inscribed upon parchment. The buoys will be fastened to a pendant line, one be­neath the other. The balloon when inflated to its full capacity will carry the buoys up­ward not less than three miles, and southerly air currents will waft them on their several journeys. Generally they will be placed afloat during the prevalence of northerly winds. The natural leakage of gas will probably cause the balloon to descend to the ice or water, as the case may be, in from eight to ten hours after its ascen­sion. By an ingenious arrangement known as the liberator, the lowermost buoy will be released from its attachment immediately upon contact with water or land surface. The release of its weight will cause the balloon to rebound into the air, and it will then continue its progress for about five hours, dropping again at intervals, until the very last buoy has been deposited either in the Polar current or in the open waters. The carrying power of these balloons will ensure the buoys being placed where they will almost certainly be picked up by Arctic whaling and sealing vessels or even by trans­atlantic liners. The recovery of these buoys will establish much valuable data concerning the air and sea currents of the Arctic re­gions. Of the thirteen buoys probably set adrift by Andree during his memorable bal­loon voyage, two have thus far been re­covered; one, dated beyond the eightieth parallel, was found some months later off the north coast of Iceland, while the other was picked up on King Charles's Land to the eastward of Spitzbergen, nearly 1,200 miles from Iceland. It should be remembered that Andree employed no device for releasing his buoys, being compelled to throw them from the car of his balloon, and it is possible that some of them were therefore crushed and .broken by their fall. It is only fair to assume, therefore, that a much larger pro­portion of our buoys will be recovered. The expedition numbers thirty-five men besides myself, and includes a geodesist, a meteorologist, surveyor, photographer, trans­lator, cartographer, and secretaries. There is considerable musical talent in our party, and in order to give vent to their several talents it was necessary to provide for a violin, guitar, mandolin, banjo, auto­harp, single and double accordions, a triangle, tambourine, ocarina, violin, cello, bu­gle, harmonica, and cylinder flageolets. With these, and a carefully selected library of choice books, boxing gloves, fencing foils, gymnastic paraphernalia of various sorts, and a variety of games, we shall manage to while away probably all of the tedious and trying hours which would otherwise lie be­fore us during enforced hours of physical idleness. We believe in employing every talent of the component members of the ex­pedition, and consider that therein will lie a means of maintaining harmony and good­ will among our unusually large party. I desire here to emphasize the fact that the Baldwin-Ziegler Expedition was organized to reach the Pole. Neither scientific research, nor even a record of "Farthest North," will suffice; only the attainment of that much sought for spot where one can point only to the south can satisfy our purpose. If, from any cause not now foreseen, our efforts during the summer of 1902 should prove fruitless, we shall remain in Franz ­Josef Land until the spring of 1903, when the effort will be renewed. Fresh supplies and equipment will be forthcoming, and 1903 will find us fully prepared for another strug­gle with the unknown. But I do not antici­pate such a contingency. Originally published in McClure's Magazine. 1901.